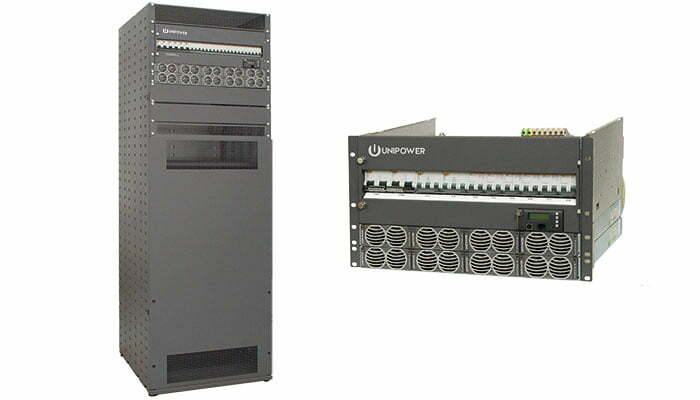 Guardian Dual is a family of dual 48V and 24V DC power systems providing outputs of -48VDC and +24VDC in either 5RU/6RU rack-mount or free-standing cabinet configurations. All versions can accommodate up to five or ten Guardian family high efficiency hot-swap rectifiers and dc-dc converters. The cabinet versions offer 1.4m, 1.8m or 2m floor standing cabinets or an 18RU high wall-mounted cabinet which also accommodate up to 3 battery strings. A load current of 300A at -48V is available with battery charge current software controlled subject to an overall 360A while the secondary load is up to 250A at +24V. The rectifiers and dc-dc converters are internally fan cooled with speed control which is a function of load and temperature, keeping acoustic noise to a minimum. The DC output circuits can provide up to 26 loads which utilize circuit breakers rated from 2A to 63A plus up to six 100A or 125A breakers that provide battery protection. An optional extension PDU module provides a further 24 load circuits. A programmable 400A low voltage battery disconnect (LVBD) is standard while one or two partial load disconnects (PLD), rated at 125A, 200A or 400A and also programmable, can provide non-critical load shedding when operating on batteries. Battery Disconnection Provides voltage controlled disconnection of batteries. Boost Charging Manual time controlled or automatic boost charging with adjustable time and voltage levels. Battery Tests Automatic or manual testing of batteries up to six times per year with a 10 test memory. Variables include test duration and end voltage. Battery discontinuance test to ensure battery connection. Enhanced Battery Monitoring Monthly logging of essential battery parameters including temperature, temperature hours, current, charging voltage and symmetry voltage, Data logged for 5 years. Site Logs System tools developed to assist site management. Daily peak load and statistic logs available. Symmetry Measurement Optional tool that measures batteries for early detection of thermal runaway. Allows continuous adjustment of output voltage according to battery temperature. Features include adjustable compensation factor and separate thresholds for high temperature alarms. Load Shedding (PLD) Optional feature that allows voltage or time controlled disconnection of non-essential load.